TV illusionist and mentalist David Meade today joined BT in urging secondary school students from across Northern Ireland to put pen to paper and submit an entry for the 2019 BT Young Scientist & Technology Exhibition (BTYSTE), ahead of the September deadline. Now in its 55th year, BTYSTE is one of the largest and longest running STEM (Science, Technology, Engineering and Maths) events in the world. The exhibition allows students the space to explore STEM subjects and demonstrate creativity by creating a project of their choice that can help them to turn an idea into reality. Getting involved is simple: students can enter either as an individual, or as part of a group, and submissions can be made in any one of four categories. These include: technology, social and behavioural science, biological and ecological science, or chemical, physical and mathematical. Students are asked to upload a one-page proposal outlining their idea before the deadline of Tuesday 25th September 2018 to www.btyoungscientist.com. David Meade, official ambassador for BTYSTE, said: “The BT Young Scientist & Technology Exhibition is a one-of-a-kind event and encourages students to really challenge themselves and to develop their interest in STEM subjects. It’s also a great opportunity for young people to just have fun and explore their interests, expand their imagination and make new friends from across the island of Ireland. Mairead Meyer, Managing Director of NI Networks at BT in Northern Ireland added: “This year’s theme is ‘It Starts Here’, signifying that BTYSTE really can be the starting point of a bright and brilliant future for our young people. 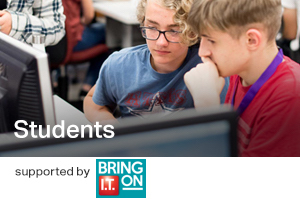 Taking part allows them to engage in independent learning and now, with the summer holidays starting, it’s the perfect time for students to get to work on their potentially award-winning entries. Maths teacher, Amy McConnell, says she and her fellow teachers at Abbey Community College in Newtownabbey have been encouraging students to come up with ideas and work on potential BTYSTE projects over the summer holidays. The BT Young Scientist & Technology Exhibition will take place from the 9th- 12th January 2019 at the RDS in Dublin. The exhibition offers one of the most coveted awards for participants, with a substantial prize fund and the BTYSTE perpetual trophy, as well as over 140 prizes for individuals, groups, and teachers. BT has also reinforced its commitment to supporting schools from across Northern Ireland to enter this year’s exhibition with a travel and accommodation grant. Schools which are located over 70km from the RDS in Dublin, where the exhibition is held, are eligible to apply for a grant of up to £1,350. The BT grant allows an ever-increasing number of young people from both rural and urban areas to participate in the exhibition.